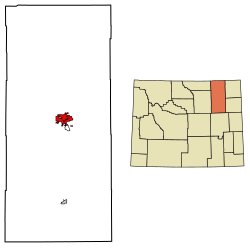 Location of Gillette in Campbell County, Wyoming. The census-designated place Antelope Valley-Crestview was annexed by the city on January 1, 2018. The population of Antelope Valley-Crestview was 1,658 at the 2010 census and it has a total area of 4.9 square miles (12.7 km²). Gillette is located at 44°16′58″N 105°30′19″W﻿ / ﻿44.28278°N 105.50528°W﻿ / 44.28278; -105.50528 (44.282660, −105.505256). It is situated between the Bighorn Mountains to the west and the Black Hills to the east, in the Powder River Basin. As of the census  of 2010, there were 29,087 people, 10,975 households, and 7,299 families residing in the city. The population density was 1,533.3 inhabitants per square mile (592.0/km2). There were 12,153 housing units at an average density of 640.6 per square mile (247.3/km2). The racial makeup of the city was 92.2% White, 0.4% African American, 1.2% Native American, 0.7% Asian, 3.2% from other races, and 2.2% from two or more races. Hispanic or Latino of any race were 9.5% of the population. There were 10,975 households of which 38.9% had children under the age of 18 living with them, 49.2% were married couples living together, 10.3% had a female householder with no husband present, 7.0% had a male householder with no wife present, and 33.5% were non-families. 24.3% of all households were made up of individuals and 4.7% had someone living alone who was 65 years of age or older. The average household size was 2.61 and the average family size was 3.09. The median age in the city was 30.6 years. 28% of residents were under the age of 18; 10.9% were between the ages of 18 and 24; 30.6% were from 25 to 44; 24.8% were from 45 to 64; and 5.8% were 65 years of age or older. The gender makeup of the city was 52.3% male and 47.7% female. The Wyoming Center, a 9,000 seat arena located at the CAM-PLEX just east of the city, was completed in 2008. The CAM-PLEX hosts events ranging from concerts and balls to the National High School Finals Rodeo. Public education in the city of Gillette is provided by Campbell County School District #1. Gillette is home to Campbell County High School and Thunder Basin High School. Gillette College, a two-year college, is part of the Northern Wyoming Community College District. At Gillette, Wyoming there is a LORAN-C transmitter at 44°00'11" N and 105°37'24" W. Its antenna, a 700 ft (213.36 meter) high guyed radio mast. In David Breskin's bildungsroman The Real Life Diary of a Boomtown Girl , Randi Bruce Harper is raised by parents in the Wyoming "oil-field service business;" as an adult she drives a Wabco haul truck "down in the pit" while living with her husband in Gillette. Randi is a member of the first all-female blasting team, the "Boom-Boom Girls." ^ City of Gillette (2018). "City of Gillette Organizational Chart". Gillette, Wyoming. City of Gillette. Archived from the original on 2018-01-25. Retrieved 2018-05-29. ^ a b "City Council Gillette Wyoming". Gillette Wyoming. City of Gillette. 2018. Retrieved 2018-05-12. ^ a b United States Census Bureau. 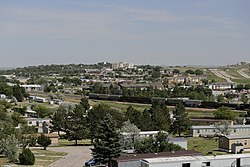 "U.S. Census Bureau Quick Facts: Gillette city, Wyoming". United States Census Bureau. United States Census Bureau. Retrieved 2019-02-01. ^ "Coal Mine Tours - Campbell County Chamber of Commerce Gillette, WY". Gillettechamber.com. Archived from the original on 2014-11-14. Retrieved 2014-10-30. ^ "Gillette, WY Population - Census 2010 and 2000 Interactive Map, Demographics, Statistics, Quick Facts". Censusviewer.com. Retrieved 2014-10-30. ^ Urbanek, Mae (1988). Wyoming Place Names. Mountain Press Publishing Company. p. 81. ^ Edward Gillette (1925). Locating the iron trail. The Christopher Publishing House. p. 75. Retrieved 28 August 2012. ^ Kelley, Mary (2010). Images of America: Gillette. Arcadia Publishing. p. 7. ISBN 978-0-7385-8026-5. ^ a b "Historical Decennial Census Population for Wyoming Counties, Cities, and Towns". Wyoming Department of State / U.S. Census Bureau. Retrieved 2008-06-30. ^ Thompson, James G. (1979). "Gillette Syndrome A myth revisited?". Wyoming Issues. 2 (2): 30–35. Retrieved 2017-12-19. ^ a b Filbin, Patrick (2018-03-08). "City Accepts Deeds to Annexed Parks". Gillette News Record. Gillette, Wyoming. Retrieved 2018-08-16. ^ "US Gazetteer files 2010". United States Census Bureau. Archived from the original on 2012-03-12. Retrieved 2012-12-14. ^ Stueck, Dave. Trees & Shrubs for Gillette and Campbell County. Campbell County Rockpile Museum. p. preface. ^ PRISM Climate Group (2018). "USDA Plant Hardiness Zone Map". USDA Agricultural Research Service. United States Department of Agriculture. Archived from the original on 2018-11-06. Retrieved 2018-11-09. ^ "Summary of Monthly Normals" (PDF). National Oceanic and Atmospheric Administration. Archived from the original (PDF) on 2019-01-31. Retrieved 2019-01-31. ^ "Gillette, WY Monthly Weather Forecast". The Weather Channel. Retrieved 2019-01-31. ^ Kelley, Mary (2010). Images of America: Gillette. Arcadia Publishing. p. 15. ISBN 978-0-7385-8026-5. ^ United States Census Bureau. "Profile of General Population and Housing Characteristics: 2010". American Fact Finder. United States Census Bureau. Retrieved 2018-05-29. ^ United States Census Bureau. "Profile of General Demographic Characteristics: 2000". American Fact Finder. United States Census Bureau. Retrieved 2018-05-29. ^ "Keyhole State Park". Wyomingtourism.org. Retrieved 2018-01-09. ^ City of Gillette (2017-07-01). "City of Gillette Organizational Chart". Gillette, Wyoming. City of Gillette. Archived from the original on 2017-10-29. Retrieved 2018-05-23. ^ "About City Council Meetings". Gillette, Wyoming. City of Gillette. 2018. Archived from the original on 2017-11-04. Retrieved 2018-10-08. ^ "City Council". Gillette, Wyoming. City of Gillette. 2019. Retrieved 2019-01-22. ^ "City of Gillette Liquor Licenses". Gillette, Wyoming. City of Gillette. 2019. Archived from the original on 2019-02-23. Retrieved 2019-02-23. ^ Filbin, Patrick (2016-12-22). "Lawmakers may pop cork on liquor licenses". Gillette News Record. Gillette, Wyoming. Retrieved 2019-02-23. ^ United States Federal Communications Commission. "FM Query Broadcast Station Search". Federal Communications Commission. United States Federal Communications Commission. Retrieved 2018-08-16. ^ United States Federal Communications Commission. "AM Query Broadcast Station Search". Federal Communications Commission. United States Federal Communications Commission. Retrieved 2018-08-16. ^ Theodric Technologies (2018). "Radio Stations in Gillette, Wyoming". radio-locator. Archived from the original on 2018-08-16. Retrieved 2018-08-16. ^ "City of Gillette: Gillette Public Access". Gillettewy.gov. Retrieved 2018-01-09. ^ Koile, Kevin (2015-02-10). "Wyoming Army National Guard Unit To Be Deployed To Afghanistan". K2 Radio. Archived from the original on 2018-04-16. Retrieved 2019-01-04. ^ City of Gillette (2018). "Discover Gillette". ArcGIS. Retrieved 2018-05-29. ^ Kelley, Mary (2010). Images of America: Gillette. Arcadia Publishing. p. 60. ISBN 978-0-7385-8026-5. ^ "The Gillette-Campbell County Airport". Iflygillette.com. Retrieved 2012-06-05. ^ "Players by birthplace". Baseball Reference. Sports Reference. 2018. Archived from the original on 2018-06-21. Retrieved 2019-02-26. ^ "Gillette Mayors". Gillette Wyoming. City of Gillette. 2018. Archived from the original on 2017-02-11. Retrieved 2018-08-28. ^ "Mark A. Klaassen Sworn in as United States Attorney". United States Department of Justice. United States Attorney's Office District of Wyoming. 2018. Archived from the original on 2018-05-03. Retrieved 2019-01-30. ^ "Biographical Profile for Jillian Balow". Vote-wy.org. Retrieved December 11, 2014. ^ Breskin, David (October 17, 1989). "The Real Life Diary of a Boomtown Girl". Viking. Retrieved August 29, 2018. ^ Cameron, James (executive director). Dark Angel (Television production). United States: Fox. ^ Collins, Max Allen (October 2002). Dark Angel: Before the Dawn. Random House Publishing Group. p. 3. ISBN 9780345463210. ^ Diivine (2007-03-24). "Two of a kind". FanFiction. Retrieved 2018-01-23. ^ Doc Dracula (2006-02-27). "L'ennemi Caché". FanFiction. Retrieved 2018-01-23. ^ The News-Record staff (1998-12-10). "Police tell of Trover affair with her boss". The News-Record. Gillette, Wyoming. pp. 1, 12. ^ "School House Rocked". Redrum. Season 3. Episode 13. 2015-05-19. ^ "Turmoil". Murderous Affairs. Season 1. Episode 32. 2016. ^ Collins, Abby (2012-10-31). "Sister Cities". Gillette News Record. Gillette, Wyoming. Retrieved 2017-12-21. ^ Collins, Abby (2012-06-12). "Gillette and Yulin, China, are on a path to be sister cities". Gillette News Record. Gillette, Wyoming. Retrieved 2017-12-21. Wikimedia Commons has media related to Gillette, Wyoming.